Soybeans, soyoil, soymeal and corn traded lower. Wheat traded higher. US Dollar was higher. Crude was higher. US stocks were higher. Some concern that lower Argentina soybean and soymeal export prices might reduce US soybean exports, AFS could continue to spread in China and reduce soybean import demand and concern that US sanctions against Iran oil could delay US and China trade deal weighed on soybean prices today. China is a large buyer of Iran oil. 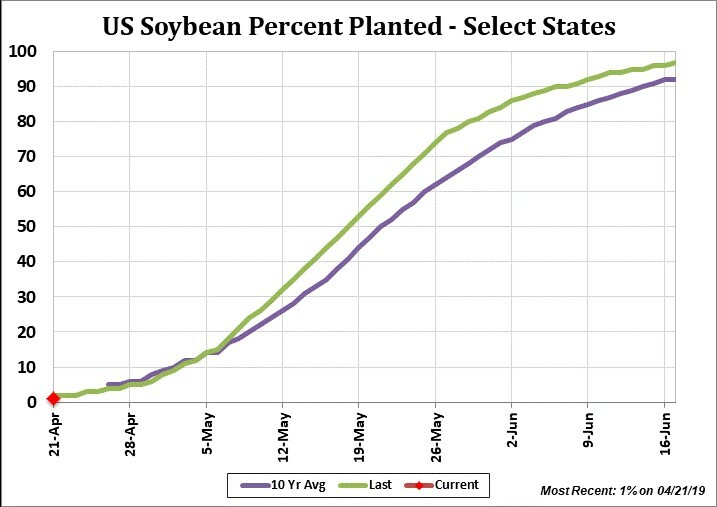 USDA est that 1 percent of the US 2019 soybean crop is planted vs 2 ave. Trade assumes that US farmers will plant 84.6 million soybean acres in 2019 versus 89.2 last year. Trend yield near 51.0 could produce a crop near 4,300 mil bu vs 4,544 last year. This could suggest a carryout near 875. Brazil soybean harvest is near 92 percent done. Argentina soybean harvest is near 34 pct done vs 39 last year. US domestic soybean basis is firming on lack of farmer selling. Funds are net short 99,000 soybean contracts. New lows for the move could add to net short position. Fundamental news remain mostly bearish. Corn futures traded lower and made new lows. Despite a record fund corn short, funds added to shorts on concern that lower South America prices will reduce US export demand. Trade also assumes that US 2019 corn crop will get planted and normal summer weather will add to US carryout. USDA estimated that 6 percent of the US 2019 corn crop is planted versus 12 average. Trade assumes that US farmers will plant 92.8 million corn acres in 2019 versus 89.1 last year. Trend yield near 177.0 could produce a crop near 15,100 mil bu vs 14,420 last year. Total 2019/20 US corn demand is estimated near 14,925. This could suggest a carryout near 2,350. US domestic corn basis is firming on lack of farmer selling. Funds are net short a record 324,000 corn contracts. New lows could add to net short position. Fundamental news remain mostly bearish.US sanctions against Iran crude oil helped rally Crude oil futures. Some though fear that given fact China is a large buyer of Iran oil that US sanctions could delay US and China trade deal. Wheat futures found some support from liquidation of long corn and short wheat spreads. Talk of drier weather in parts of EU and Canada may have also offered support. USDA estimated that 5 percent of the US 2019 spring wheat crop is planted versus 22 average. 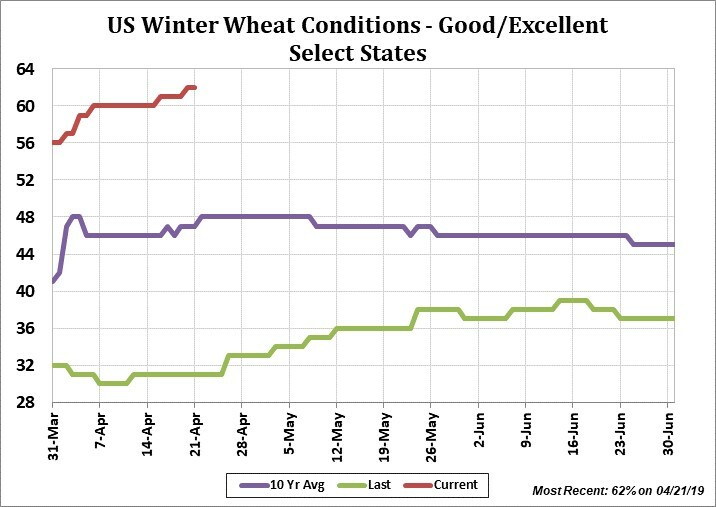 62 percent of the US 2019 winter wheat crop was rated good/ex vs 31 ly. Trade assumes that US farmers will plant 45.8 million wheat acres in 2019 versus 47.8 last year. 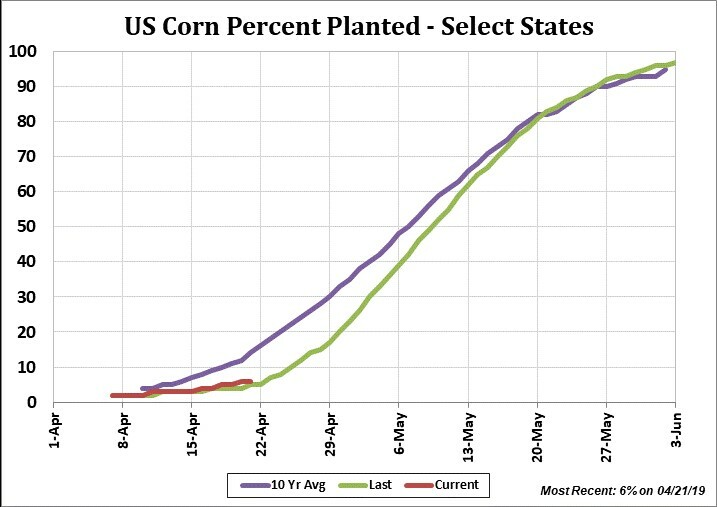 Trend yield near 49.5 could produce a crop near 1,935 mil bu vs 1,884 last year. Total 2019/20 US wheat demand is estimated near 2,050. This could suggest a carryout near 1,150. Still adequate. Funds are net short a record 68,000 wheat contracts. New lows could add to net short position. Fundamental news remain mostly bearish. The information conveyed by ADMIS or its affiliates to the audience is intended to be instructional and is not intended to direct marketing, hedging or pricing strategy or to guaranty or predict future events, including the pricing and pricing movements of commodities and commodity futures contracts.